St. Lucia Travel & Tours | Shore Excursions & Trips | 5 Top Reasons To Choose Real St Lucia Tours. From hiking to swimming to ziplining through the rain forest, we help you do it all! Get the insider knowledge with your own personal St Lucia guide. All our guides are native St Lucians who are passionate about their home and will give you his or her complete and undivided attention, ensuring you are well looked after and your every need catered for. Tailor-make your excursion to suit you. All our St Lucia tours and trips are totally flexible and so we will help you plan an itinerary based on your individual requirements, advising on the best excursions and St Lucia attractions. Let us take the strain and remove the hassle from your holiday plans – we can organise airport transfers, VIP Airport Transfers, meals, day trips and overnight accommodation. Whatever you want, you simply have to ask. We offer the personal touch – from the minute you book with Real St Lucia Tours, our friendly and personable staff will keep in regular contact with you, giving you all the information and details you’ll need, and ready to answer any questions you might have. Our tours won’t break the bank! Our St Lucia tour prices are affordable and offer great value for money. And many of our island’s most beautiful and interesting attractions won’t cost a single cent to visit. There are so many things to do in St Lucia that it will be well near impossible to see and do everything in one visit. But regardless of how much time you have to spend on St Lucia, Real St Lucia Tours can create a superb itinerary that introduces you to the very best this jewel in the Caribbean has to offer, helping to make your trip here the journey of a lifetime. The crystal clear blue waters of the Caribbean lap St Lucia’s western coast while Atlantic breakers crash on to the more rugged east coast, with its cliffs and hard-to-reach coves. Both coasts are perfect for snorkeling and scuba diving and our experienced guides can organise St Lucia excursions for the perfect day out beneath the ocean waves for those with a sense of adventure. Learn about St Lucia Cruise Tours! ​The wide variety of St Lucia activities and things to do, make it essential that your guide is someone who knows the island, and knows exactly what they’re talking about. 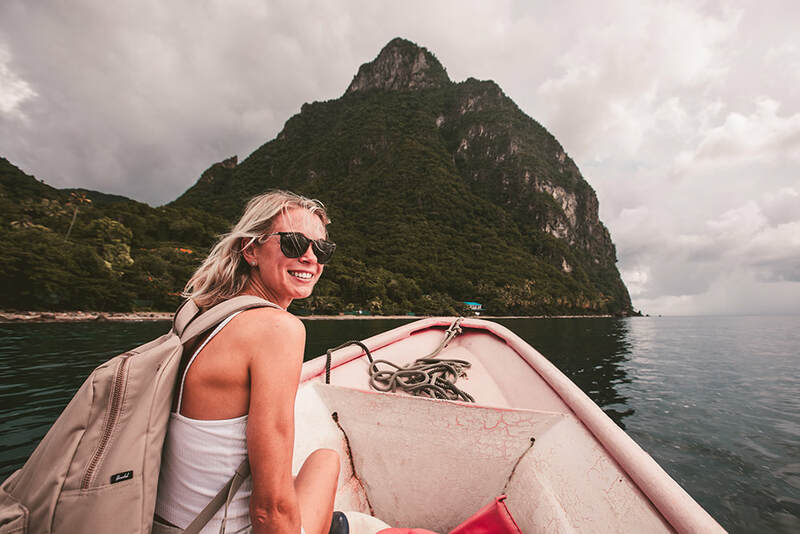 Our guides are all native St Lucians who love their island home and can’t wait to share it with you on a tour of St Lucia, whether you’re a first-time visitor or a regular to this most beautiful of environments. Our motto is “show a customer a good time” and it’s one we strive to live up to with every single group we take out on our tours of St Lucia. Traveling with Real St Lucia Tours takes away any possible stresses involved in your holiday and we understand how important the personal touch is on your trip. All our tour guides are knowledgeable and enthusiastic about their island home. They’re also happy to be flexible with your own itinerary for a tour of St Lucia if there’s something in particular you’re keen to see or do – maybe zip lining through the rainforest canopy or horse riding through the vast plains and mountain tracks of central St Lucia. We take nothing for granted and know that you want to travel in comfort and style. Not for us ungainly big tour buses – for a start, they’d struggle to negotiate St Lucia’s notoriously winding and steep roads! Our St Lucia sightseeing tours are specially designed for small groups – many of our guests are individual travelers so days out with us are a terrific way for you to enjoy the company of like-minded individuals doing something you’re all interested in and hopefully make new friends. Learn about Shore Excursions in St Lucia. Our small group ethos is best demonstrated in our brand-new 14-seater, air-conditioned buses that let you sight-see from on board and still be close to your guide so you can ask any and every question you like as you tour St Lucia. We also organise boat cruises that will whisk you around the coastline to the most interesting St Lucia things to do and the sea-bound St Lucia sightseeing excursions.